You may have heard of a small movie franchise called Star Wars. The character of Yoda was played by a puppet voiced and operated by famous puppeteer and visionary Frank Oz. Yoda was a Jedi master who helped train Luke Skywalker to realize his full Jedi potential. He resided on the Dagobah System, living in a swampy, creature-infested area. 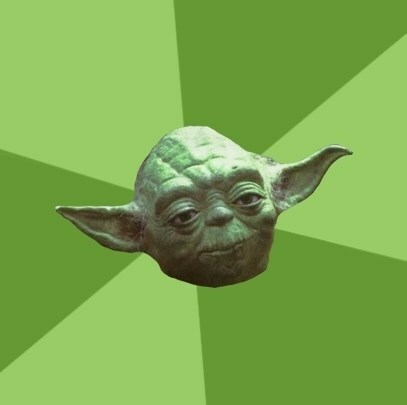 While wise and strong, Yoda has a particularly interesting verbal tic. He rearranges the sentence structure when he speaks, so that often, his sentences begin with an adjective . For example, instead of saying what most in normal parlance would phrase “You must be strong”, master Yoda would turn the phrasing and say “Strong, you must be”. While grammatically correct, it nonetheless provides a rich breeding ground for jokes phrased in this particular style. In addition, Yoda mainly gave advice and teachings, so the theme of this meme often centers around the wisdom of Yoda as he would relate it to skills and lessons that would be taught in the modern world. The meme graphic shows Master Yoda, with his cane, looking pensive. The background is a yellow and green starburst with Yoda at the center.